What a thrill: Kitesurfing is an additive sport. Kitesurfing may not be the most popular activity to grace shores, but once you become familiar with the unique watersport, it’s hard not to love. For starters, kitesurfing combines different aspects of various watersports, drawing from windsurfing, paragliding, wakeboarding and more. That multidimensional nature is what attracted Mostafa Al Hussaini, owner and founder of Dukite, a Dubai-based kitesurfing and stand-up paddleboarding school and shop. “It’s a bit of kite flying, wakeboarding and surfing. It was a multi-factorial pleasure, having fun from so many different aspects,” said Hussaini. Addicted is what Hussaini became after giving up his full-time job as a dentist to pursue kitesurfing, despite having no previous experience with watersports. It wasn’t a seamless transition, however, with Hussaini initially finding little support for kitesurfing in the UAE, which motivated him to open up Dukite in 2005. “There was a lack of getting proper kitesurfing instruction in Dubai,” Hussaini said. “Most of the instructors available were parttime, so it was very difficult to start myself when I wanted to learn. So Hussaini opened a shop for kitesurfing and paddleboarding equipment, bringing over brand names like Roberto Ricci Designs, Prolimit, Pat Love, Airush, Xenon Boards, Starboard and more. On the school side, Dukite now boast 11 kitesurfing instructors and three paddleboard instructors, carrying certification from the International Kiteboarding Organization (IKO), Academy of Surfing Instructors (ASI) and Verband Deutscher Windsurfing und Wassersportschulen (VDWS). The courses will take first-timers and teach them the necessary skills and safety instruction to ultimately turn them into independent kitesurfers. Once you’ve learned the sport, the sky is the limit as to how far you can push the boundaries. “You’re always in full control of everything,” said Hussaini. Courses range from eight to 10 hours of private lessons, which cost Dh350 per person for one hour and up to Dh2,800 for eight hours. Rates are inclusive of equipment. If you’re ready to ride like the wind with Dukite, visit www.dukite. com to get started. Dubai Sports City is set to stage their biggest cycling event to date as they prepare to host the seventh edition of the Great Dubai Pulse Ride with the family event expecting to see more participants than ever before. On Friday, March 4, beginning at the Rugby Zone, Sports Village will welcome cyclists from across Dubai, offering three different routes and distances for participants to take on, with a full support team on hand to manage the event. With 5km and 10km family rides to choose from as well as a 20km professional route, where bicycles from Cycle Hub are up for grabs, it promises one not to be missed. More than 5,000 people have competed since its launch in 2013, and with their last edition in November attracting 500, it has now become a must-do for Dubai Sport City residents and keen cyclists. Now in its fourth year, The Great Dubai Pulse Ride is in a collaboration between Dubai Sports City president, Khalid Al Zarooni, and Dubai Sports Council. It takes advantage of unused land behind the vast sports and lifestyle community, offering a perfect cycling environment for the family. “It’s always an exciting time of the year as we prepare for the Dubai Pulse Ride,” said Al Zarooni. “To be able to use the land around Dubai Sports City provides us with a great playground for cyclists and it’s only right that we take advantage of what is on our doorstep. A great day out: You can choose from 5km and 10km family rides. The Great Dubai Pulse Ride is part of a hugely growing community at Dubai Sports City, and while not exclusive to residents of the lifestyle community, it is another pillar of its sporting and active-lifestyle amenities. Dubai Sports City has already had a busy start to the year. Both the Masters Champions League and Pakistan Super League have been staged at the Dubai International Stadium, while European football sides have been using the state-of-the-art facilities for a warm weather training camps. The Dubai Tour also passed through Dubai Sports City as part of its four-day race across the UAE earlier this month. The Great Dubai Pulse cycle ride however, is now one of the stand-out community events and considered to be one of the most important. “It is great for Dubai Sports City to have high-performance sport being held within our community such as cricket, football and golf,” added Al Zarooni. “To have world-class sporting superstars visit is fantastic for everyone but Dubai Pulse is special because everyone can take part. To register, visit www.cyclehub.ae with on-day registration beginning at 07:00 ahead of the 08:00 ride. Fast & Furious: That’s how the action will be at the Bounce Dodgeball League. Combine the free-flowing and exciting action of dodgeball with trampolines and you have the Bounce Dodgeball League of Champions. The league will get your adrenaline pumping as you soar through the air while dodgeballs whiz by you for the chance to claim awesome prizes. Beginning on March 1, games will run for four weeks every Tuesday and Wednesday as teams battle head-to-head in round-robin games before putting it all on the line in the knock-out finals. Whether you love dodgeball or just want to try a new way to exercise, the Bounce Dodgeball League of Champions is a perfect blend of fun competition and fitness, delivered in a friendly environment. All skill levels are welcomed to check it out. The trampoline aspect throws a monkey wrench into the sport, with players defying gravity by bouncing around vertically and horizontally. Exercise-wise, trampolining is a great way to tone muscles and improve coordination through a low-impact workout. The champions of the league and the last man standing will walk away with a Kawasaki jet ski, worth Dh65,000. As if tearing up the Dubai shores wasn’t good enough, the team will also get pizza thanks to partner Freedom Pizza, who will supply a truck load of the delicious food. Even if your team isn’t crowned ultimate champion, all participants will be invited to an epic party at the brand new Brunswick Sports Club in Mall of the Emirates on every game night, which will have a discount on beverages. 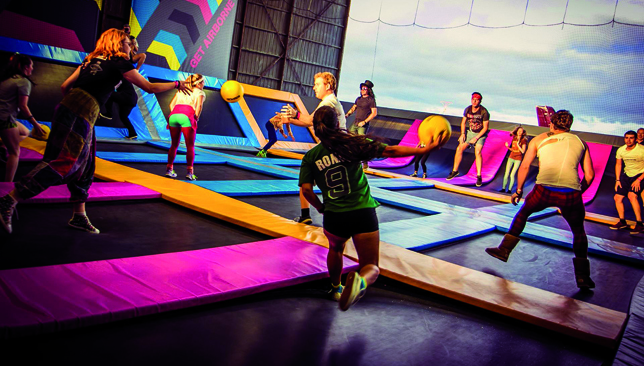 The battleground: The trampolines will provide amazing momentum to players as they try and dodge the ball. The entry fee is Dh1,500 for a team, which can have a minimum of eight people and a maximum of 10 competitors. The age limit is 21 years and older. Limited spots are available with the league consisting of 36 teams, so make sure to reserve your spot as soon possible by visiting bounce.ae/dleague. And if you register now, you will get a free dodgeball practice session for your team to prepare for the league. Gather your friends and co-workers, form a team and don’t forget the five ‘d’s’ of dodgeball: dodge, duck, dip, dive and…dodge!